Connecticut workers are getting sick on the job slightly less often than in recent years, but still more frequently than the national average, according to a new state report. 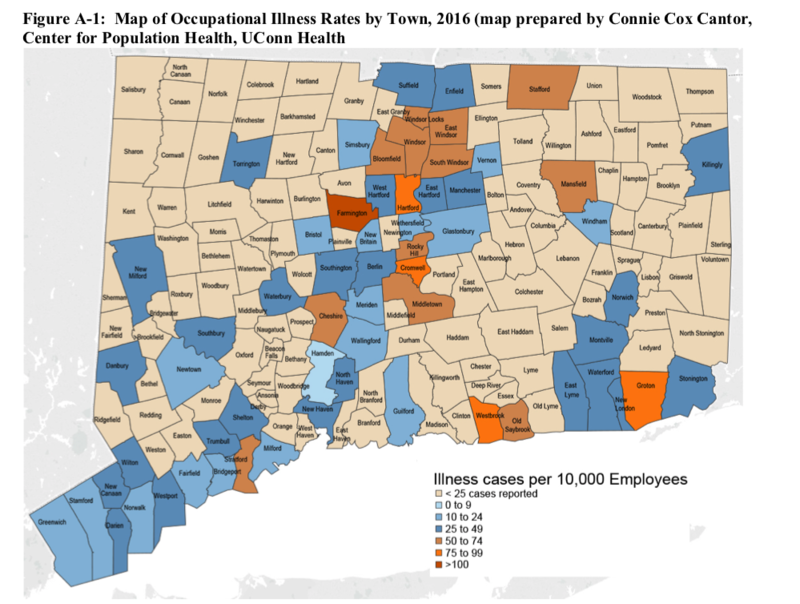 The Occupational Disease in Connecticut 2018 report, which focuses on 2016 data, shows that on-the-job illnesses fell by 2 percent since the previous year. It found Connecticut had an overall illness rate of 17.4 cases per 10,000 workers. But the state had a 6 percent higher rate of occupational illness than the average national level. Connecticut ranked 15th highest out of 41 states; Maine had the highest rate and Texas had the lowest. Connecticut’s rate has been consistently higher than the national average but is also narrowing slightly, said Tim Morse, professor emeritus at the University of Connecticut Health Center and the report’s author. Morse said Connecticut could have higher rates due to better reporting, or because the composition of industries and work in the state lead to occupational illnesses. Occupational diseases are hard to draw conclusions about because they are often underreported and larger employers tend to keep better records, Morse added. The report, which measures workplace illness and doesn’t examine acute traumatic injuries, gathers data from the state Labor Department, the Connecticut Workers’ Compensation Commission, and physicians’ reports. The report found an estimated 15,511 musculoskeletal illness cases in 2016, which Morse said usually affects the hands, arms, and shoulders through problems like tendinitis and carpal tunnel syndrome. Morse said those illnesses arise from motions like lifting, carrying, pulling or pushing. Infectious diseases were the second highest category, marking reports that included both actual disease and exposure to infectious agents. In 2016, that category was dominated by 872 reports of exposure to bloodborne pathogens, including needlestick injuries, cuts that led to blood exposure, and human bites. The report states women filed 49 percent of all workers’ compensation claims and accounted for 66 percent of infectious cases. It also found occupational illnesses occurred more in older workers, with almost half involving people between 40 and 59-year-old. Morse said most of the responsibility to curb these rates falls on employers. “Occupational illnesses are by definition preventable. They are either caused or made worse by work and so there are ways of preventing them. Not becoming complacent and saying ‘we still have a lot of illnesses that need to be paid attention to’,” Morse said.